Responding to a request from France, King David II of Scotland invaded England in October 1346. With Edward III campaigning on the continent he expected little resistance but, at the Battle of Neville’s Cross, he was intercepted and defeated by a large northern army. The defeat was absolute and he would spend over a decade as an English prisoner. The Hundred's Year War, as it would later be known, started in April 1337 with the French seeking to confiscate Gascony from Edward III. The English King responded by claiming the French throne on the grounds of his descent through his mother, Isabella of France. Initial French successes - including naval raids on Southampton, Portsmouth, the Channel Islands and several of the Cinque Ports - came to an end following Edward's victory at the Battle of Slurs fought on 22 June 1340. For the next few years the war focused on the succession to the Duchy of Brittany and it was not until Summer 1346 that Edward was ready to launch a major offensive into France. He landed in Normandy, captured Caen, and ultimately engaged King Philip's forces at the Battle of Crécy on 26 August 1346. The outcome was a disaster for the French - Edward III, using experience gleaned at the Battle of Halidon Hill, deployed his longbow men to devastating effect resulting in thousands of Knights killed or captured. With no French army capable of stopping him, he moved north and besieged Calais. The French now sought help from Scotland under the so-called Auld Alliance. A treaty between the two nations had been signed in 1295 and renewed in 1326 - the latter in the heyday of Robert the Bruce. But the French had singularly failed to come to the Scots assistance when Edward III started the Second War of Scottish Independence in 1332 - a crushing English victory at Halidon Hill had been followed by the young King of Scotland - David II – fleeing abroad to France. But English interest in Scotland waned in favour of the continental war that offered richer rewards. The power vacuum allowed David II to return to his country in 1341. By Summer 1346 he was in his early twenties and in his prime for military adventure. Doubtless keen to settle a score with England, when he received the French request for support, he eagerly responded to the challenge and started preparations for an invasion of Northern England. David II invaded in early October with his army reducing various strongholds and sacking Lanercost and Hexham Abbeys. By 16 October 1346 he was in vicinity of Durham but, perhaps dissuaded from attacking it directly due to its strong defences, held his army at nearby Bearpark. He was doubtless pleased - he had advanced far into English territory fulfilling his duty to the French. Moreover, with Edward III and the greater part of the English magnates in France besieging Calais, it was not anticipated that any significant response would be forthcoming in the immediate future. On the English side responsibility for defence of Northern England rested with the Wardens of the Marches. In 1346 this was held jointly by Ralph Neville, Baron Neville de Raby and Henry Percy, Baron Percy. The immensely powerful Prince Bishops of Durham also had a role in border defence, although at the time of the invasion, the occupant of the post - Thomas Hatfield, Bishop of Durham - was in France with the King. William de Zouch, Archbishop of York fulfilled his duties in his absence. Together the three men summoned an army drawn from all the counties north of the River Trent ordering them to assemble at the Prince Bishop's residence at Bishop Auckland. They marched out on 16 October 1346. As with many battles, precise numbers are almost impossible to gauge. The various chronicles are broadly reconciled that the Scottish army was probably the larger of the two and its configuration would inevitably have been heavily biased towards infantry, the majority of whom would have been armed with spears. The English army consisted of a cavalry element and archers - although the scale of these within the overall numbers is unknown. On the morning of 17 October the English advanced north from Bishop Auckland towards Durham. At Merrington, some 6 miles south of Durham, the English vanguard encountered a Scottish raiding party led by Sir William Douglas. A running battle ensued with the Scots retreating towards their camp at Bearpark. Douglas informed the King of the presence of a large English army in the immediate vicinity but suggestions that they should withdraw were rejected - the King could not believe a large army could have been mustered in the few weeks since his invasion. Instead the army marched south-east from Bearpark to intercept what was expected to be a relatively small enemy force. The English had already resolved to engage them in battle however and had made haste north to choose their ground for the coming battle. The battle was fought on a ridge of high ground that runs north/south approximately 1 mile to the west of Durham. The English occupied a point on the ridge where a flat plateau afforded them the ability to deploy their frontline in an uninterrupted line. Their left (west) flank was protected by the steep ravine down to the River Browney and on the right by a steep drop. Their position was also strengthened by the ground to the north, from where any attack must come, which gently sloped upwards towards the English frontline. This gradient was significantly more pronounced on the western side of the lines. In contrast the terrain on which the Scots needed to deploy was divided in two by a ravine which separated their western (right) flank, which was also the vanguard, from the rest of the army. This hampered the Scottish manoeuvres - not only did it delay the Centre and Left Wings in their preparations to attack but would frustrate a unified assault by the three Divisions acting in harmony. Unsurprisingly the Scottish vanguard under Sir William Douglas, on the right, was the first to be ready to attack. Of note is a small English clerical group who sallied out from Durham and occupied the hollow of Maiden's Bower. Carrying with them the sacred relics of St Cuthbert, they immersed themselves in prayer doubtless seeking the destruction of the heathens who had plundered Lanercost and Hexham. Although they soon found themselves in the Scottish area of influence, they were left unmolested throughout the battle. The Scottish Right, under Sir William Douglas, commenced the fighting with an attack on the English Left. They found their advance hampered by the terrain with the enhanced gradient in front of that section of the English lines causing them to veer to the left. This not only lengthened the line of their assault, it also disordered their ranks - both causing delay. This was exploited to the full by the English archers who unleashed their lethal bombardment into the Scottish line. Despite the fierce archery assault, the Scottish Right made contact with the English line but they failed to make much progress - the slope again giving the advantage to the English. However, the Scottish Centre and Left Divisions fared better and both were able to push their English counterparts back. The English, who had held their cavalry in the rear as a strategic reserve, now committed a significant number of them to the action. The flat plateau suited the cavalry and the subsequent charge into the Scottish Left pushed them back stabilising the English line. All uncommitted cavalry were now used to augment the entire width of the English lines. 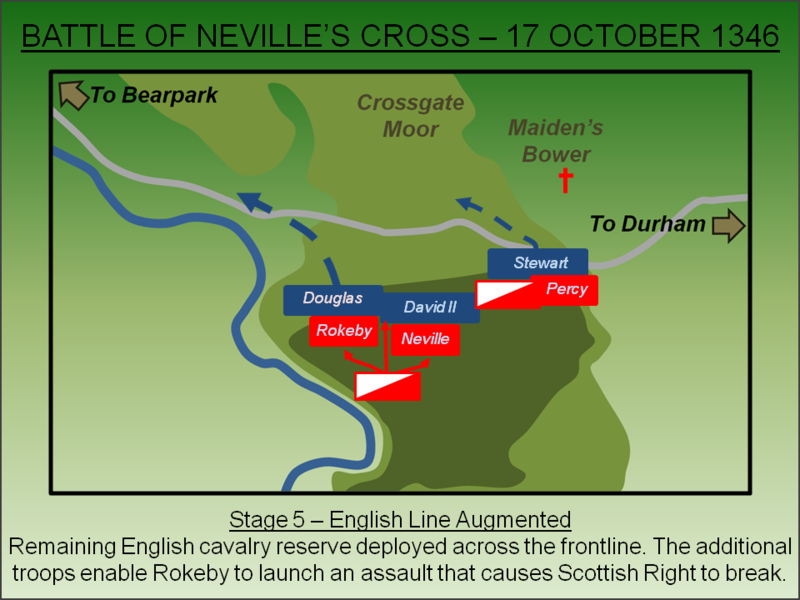 The effect of the additional forces was pronounced on the English Left where the Scots were dramatically pushed back. The Scottish Centre however, under the King himself, remained firm - but was now surrounded by English forces. 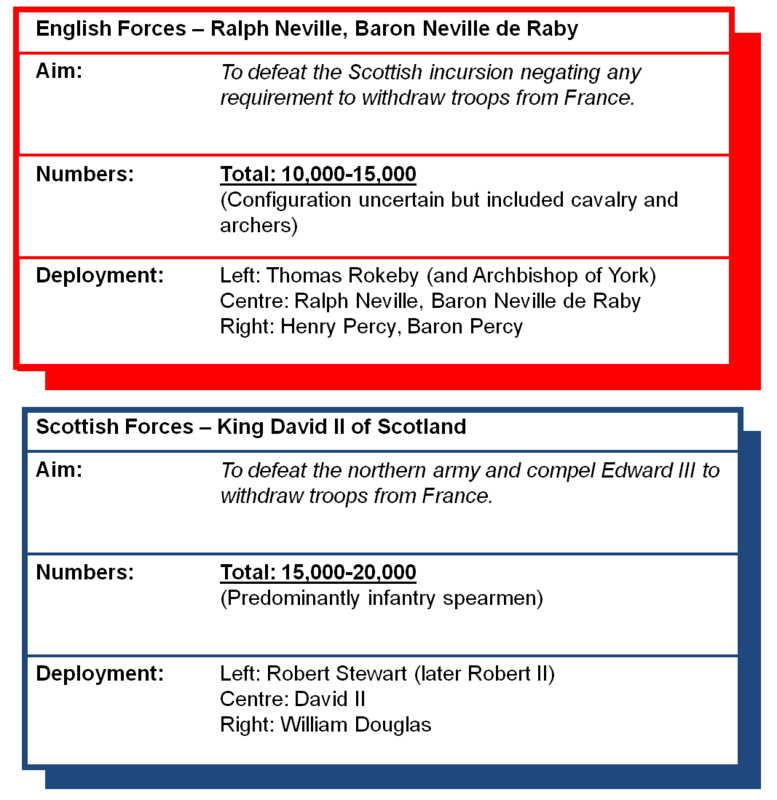 The King's central division fought on - perhaps for as long as three hours - but the arrival of additional English reinforcements under Lord Lucy prompted the remaining Scottish troops to surrender. David II fled the field, wounded and unarmed, but was quickly captured. Philip VI had intended the Scottish invasion to divert English military efforts from their siege of Calais. It failed completely. Edward III maintained his siege and, although the defences proved resilient against attempts to storm the city, by August 1347 he had starved the garrison into surrender. Calais would be an English possession, and a thorn in the side for numerous French monarchs, until January 1558. For Scotland and David II the impact was more immediate. The northern magnates now seized the initiative - Henry Percy invaded Scotland with a small army with much of the south and centre of the country falling under English control. Whilst his country was being ravished, David II would languish as a prisoner of Edward III for 11 long years residing in the Tower of London plus Windsor and Odiham castles amongst other residences. He would eventually be released following agreement of the Treaty of Berwick (1357) in exchange for a ransom of 100,000 marks in ten instalments. This treaty, which also ended the Second War of Scottish Independence and established a ten-year truce between the two countries, was never fully honoured as David's ravished country was unable to pay more than two instalments of the ransom. In 1371 David II died and was followed by his nephew, Robert Stewart, who had led the Scottish Right at Neville's Cross. Lancaster, J.H.D (2015). Durham/Neville's Cross: Battlefield visit notes and observations. CastlesFortsBattles.co.uk. Mortimer, I (2008). The Perfect King. Vintage, London. Ordnance Survey (2015). County Durham. 1:1250. Southampton. 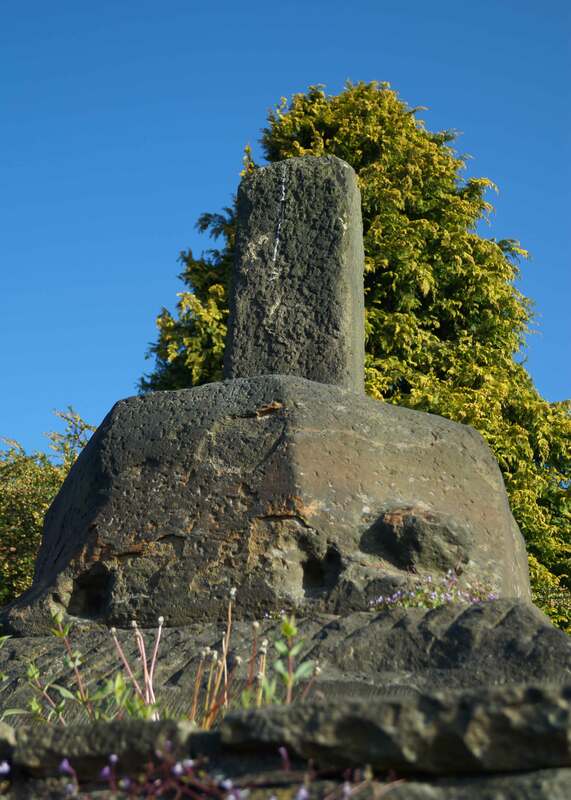 The base of cross, erected after the battle but replacing an earlier version that pre-dated the fight, can be seen. Much of the rest of the battlefield has been developed although the topography can still be appreciated. A number of information boards provide an outline of the events of the battle. Neville’s Cross. 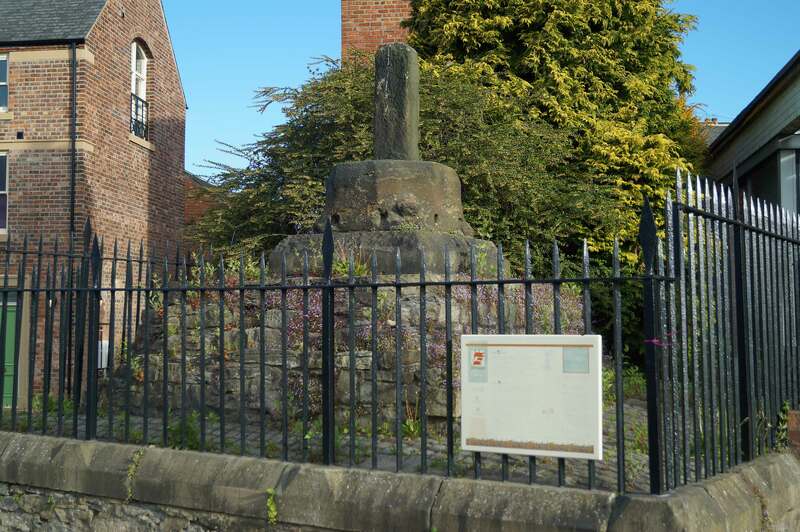 A cross existed prior to the battle and would have been one of a number that were erected on the route to Durham - they would have functioned as a place where pilgrims could rest and offer thanks for their safe arrival. 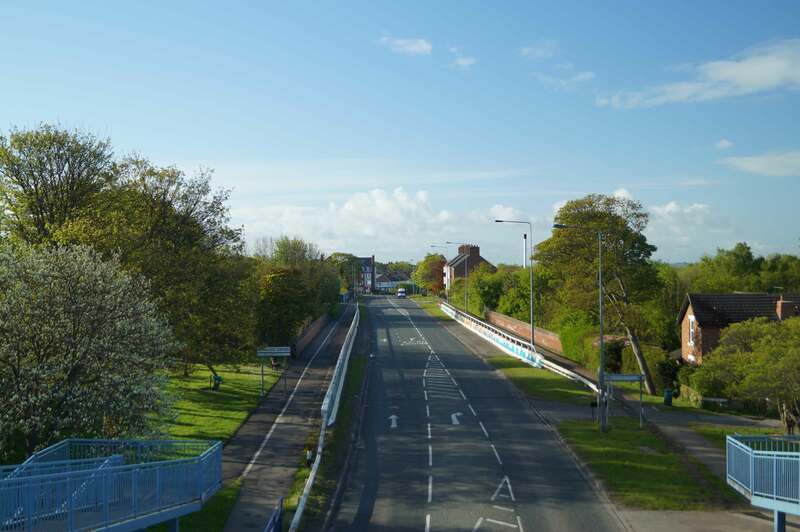 It is likely the current cross, the base of which remains, was established by Ralph Neville to commemorate his victory hence how the battle, and now the suburb, acquired the name. Originally the cross stood several metres tall and would have been topped by a fine engraved boss and crucifix. Durham. 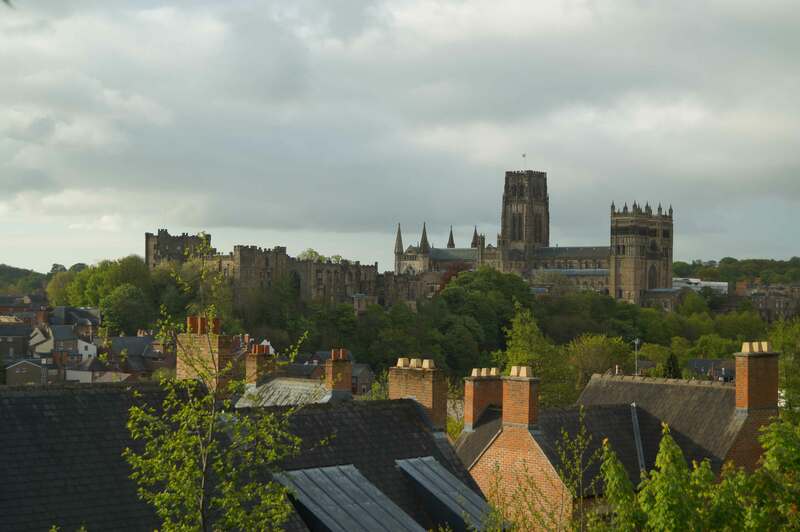 It is unclear if David II intended to attack Durham. It would have offered a magnificent prize but its strong natural defences had resisted all previous attempts to take it by storm. Bishop Auckland. 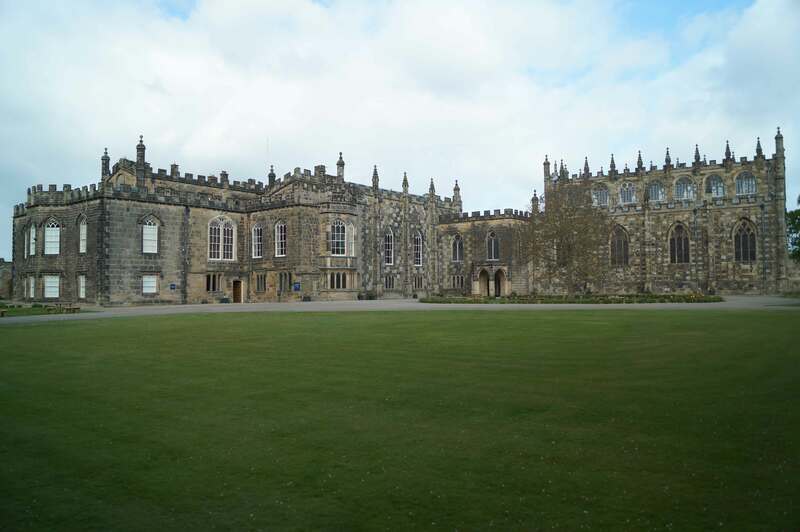 The English forces mustered at Bishop Auckland, a castle owned by the Prince Bishop of Durham. The English church enthusiastically responded to the crisis but the army was led by the secular Wardens of the Marches - Richard Neville and Henry Percy. Looking Towards English Position. Despite the battlefield now being buried under modern developments, the gentle slope rising towards the English position can still be appreciated. Toll House Road. 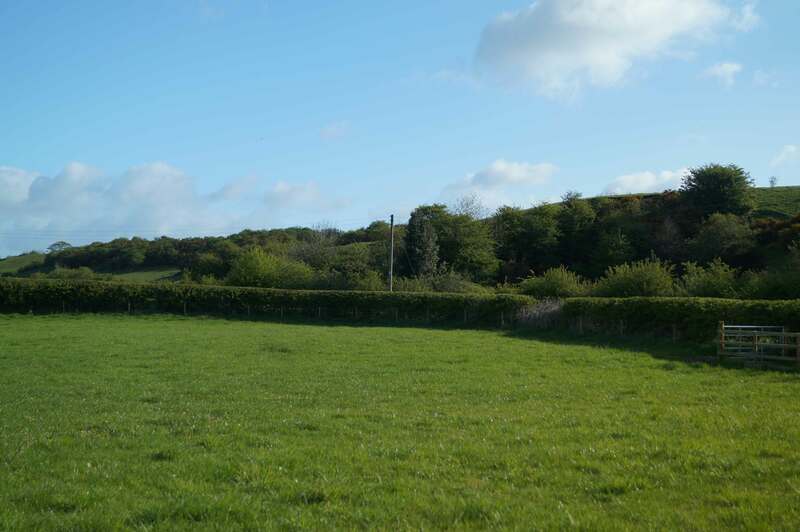 An area of undeveloped ground on Toll House Road allows the visitor to appreciate the steep slopes that ascended to the ridge of high ground on which the battle was fought. Battlefield car park is found on an unnamed road off the A1. No sign-posts but the car park itself is fairly substantial and even proceeding no further gives a good perspective of Berwick and the dominating position which Edward adopted.